Today was one of those few days a year on which the trash is collected. And today is also one of the last news-entries for this year. From November until March the Wd8 team will stay indoors, finish the reports for 2007 and prepare new projects for 2008. Regular news updates will come again when spring is here. Already for some time I am trying to make a good photo of the nose of a pig. 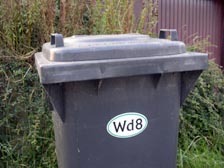 A photo, that I would like to use to create a logo for Wd8. Here is a photo I made today in the zoo in Ljubljana. 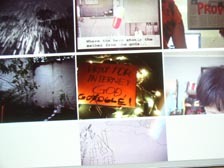 September 29th, 2007 was the presentation of the Connected:07 project in Wd8. The local - always very interested what's going on in Wd8 - old women from the village came only the next day for the presentation. One day too late... Nonetheless each of them gave us 2 Euro, 'for the art'. 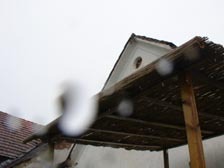 Reporter Benedikt Narodoslawsky wrote an article about the connected:07 project for the local newspaper 'Kleine Zeitung'. 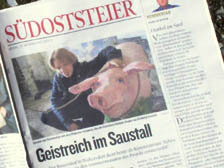 After a small photo of the pig was published on the page with events already yesterday, it was again visible on a big photo in the newspaper today. 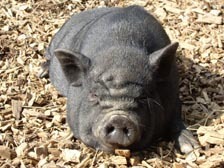 The pig is in the pigsty! It was taken on a leash around Walkersdorf today. 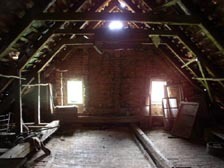 After a long walk through the village it was brought into the pigsty, where it can be seen during the next weeks. I've used the photo of the spider at the Wd8 pond for a simple flyer to announce the Connected:07 presentation. Only my printer broke down so for the moment the flyer is only virtually available on the Wd8-website. 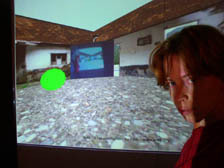 Cym in front of her virtual Wd8 reconstruction at the IMAutomaat workshop presentation last night in Hainburg. 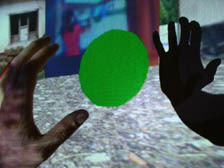 On the projection, on the small screen in the corner of the virtual farm, you can see me taking this photo. I am in Hainburg these days, experimenting with sensors at the first IMAutomaat festival. I've tried to connect sensors to the virtual Wd8 reconstruction. 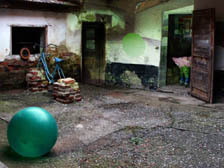 I would like it to be possible that one can interact not only with the green ball in the real space, but can also play with the green sphere in the projection. This spider was made by Nicole Pruckermayr for one of the spider webs of Eva Cajnko. 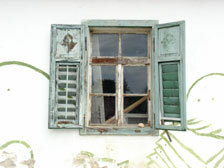 It is made out of old junk found in the old iron container in Ottendorf. The lines on the wall are the shadow of the giant spider web over the Wd8 pond. 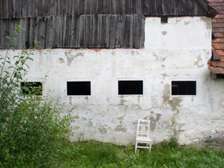 Franz Bauer does not only make the photo documentation of the different Connected artists, he also make a photo series of the Wd8 building. On this photo he is making a detailed picture of the rank growth in front of the Wd8 wall. 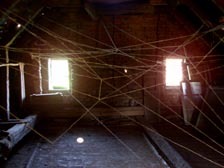 A photo of the spider web in the Wd8 attic in the early morning light. This photo was taken on Tuesday morning at 09:18. 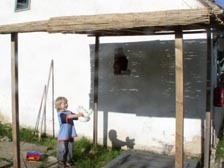 From July 25 until August 05, 2007, Rene Rusjan and Boštjan Potokar are sending postcards from Ljubljana, Slovenia to Station Nord in Honefoss, Norway. Station Nord, or Hval Station, is located next to the railroad tracks with trains passing by regularly, alternating between passenger trains and freight trains. 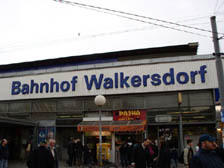 To connect with the subject, I've sent a postcard from 'Railway Station Walkersdorf'. I made this postcard in April 2006. 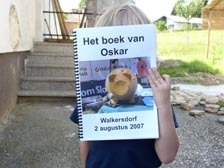 Oskar made a book today. The book is made from all the old sheets of paper that I printed out for the application to the ministry for the Connected:07 project, but that contained errors. Originally those sheets of paper were already in the old paper box. However, we took them out again and Oskar turned them into a book. Only the cover we quickly designed and added today. Walkersdorf does not really offer a beautiful sunrise. 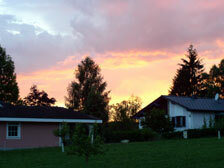 It is always light for more than an hour already when finally the sun appears behind the trees on the hill. I made this photo today at 6:53h in the morning. 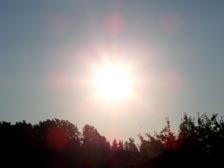 The official time for the sunrise on this day was 5:32h. Rene Rusjan and Boštjan Potokar are sending postcards to Station Nord in Norway these days. Today they intended to send a postcard from Wd8, but the heat was too much to drive all the way from Ljubljana to Walkersdorf. So they sent this beautiful photo instead. 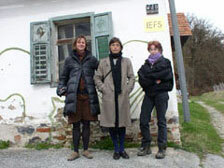 This photo was taken by Rene on February 22, 2006, when Rene and Boštjan visited Wd8 to include it into their documentary about art centers in rural places. We made a short trip to an old farm today. 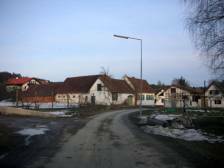 This farm is about 10 kilometers away from Walkersdorf and looks quite similar to the Wd8 building. It is going to be pulled down in the very near future. We came by to look for objects that can be used for the Wd8 machine. 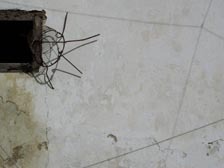 There were a lot of objects inside, that were very similar to the objects found in Wd8. We did not take a lot of old things from this farm, but among the few objects we found were some very dangerous looking instruments, that were used to work on the land, that will probably become an important part of the Wd8 machine. The installation by Nova Viator in the more than 100 years old Wd8 wardrobe is from now on playing by itself in the old house. 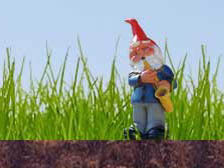 Influenced by its surroundings it creates sounds. And wenn you sit down take the time to listen you will also become more aware of the sounds in the Wd8 surroundings. The Connected:07 team visited Gsellmann's world machine today during a short Sunday afternoon trip. 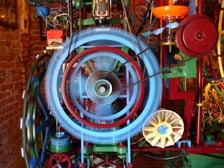 The world machine (or Weltmaschine) was built by Franz Gsellmann between 1958 and 1981. It is a pretty useless machine, built in a back room of a farm not so far from Walkersdorf. It is made mostly out of children's toys and souvenirs from places where he has never been. And when the power is switched on it starts producing all kinds of flashing lights and sounds. 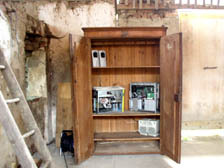 As one of the Connected:07 projects Nova Viator will build a sound installation into the more than 100 years old Wd8 wardrobe. Franz Bauer is doing the photo documentation of all the participating Connected:07 artists. The photos will be presented as part of the Connected:07 project in the different Wd8 spaces. 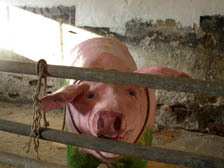 One of the Connected:07 projects is the pig of Belinda and Boris Ziegler. They are creating a life-size pig in the Wd8 pigsty. 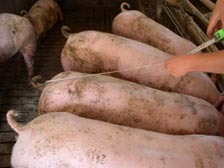 Before they started the construction of the pig, we went to one of the neighbour's houses where they still have pigs, to measure the right measurements of a real pig. 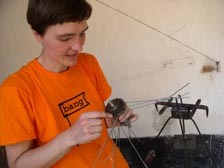 Nicole Pruckermayr was in Wd8 today, to help with the construction of a Wd8 machine. 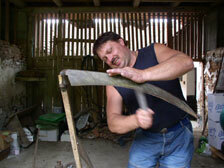 The machine will be constructed from found materials. 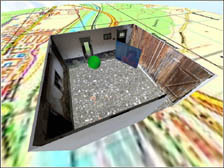 It will seem a little useless at first sight, but should function as an interface between the real and the virtual space of the Connected:07 project. 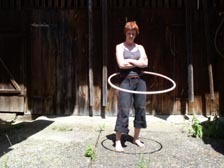 Eva Nina Cajnko taking a break in the Wd8 courtyard. Eva Nina Cajnko has arrived in Walkersdorf and spider webs are already appearing everywhere in and around the Wd8 building. Monday, July 16, 2007 will mark the start of the Connected:07 project at Wd8. Connected:07 will connect different artists with Wd8 and its surroundings. 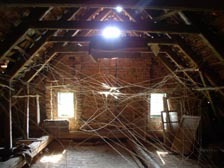 As a take off for the project slovenian artist Eva Nina Cajnko will create a giant spider web in the Wd8 attic. 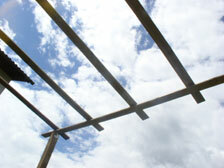 This is the photo used for the backgrounds at the Wd8 website. After using the windows for the top area of the page and the walls for the background of this area. Now also the wood on this photo has been integrated on the website as a background for the menu. 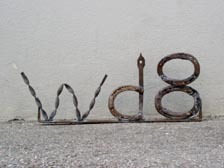 A new doorsign was made during the workshop 'experimental welding' at styrian summer art this weekend. The sign was made from found old iron and will be presented on July 21, 2007 at the exhibition 'styrian summer_art / best of 07' in Schloss Pöllau in Pöllau bei Hartberg. After the exhibition it will move to Wd8 where it will be mounted on the wall next to the entrance. 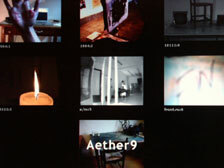 On July 07, 2007 (07.07.07) the Aether 9 group performed with 7 webcams, at 7pm UCT. This time the central theme of the performance was cooking a meal together. The Wd8 stream came live from the Wd8 kitchen. 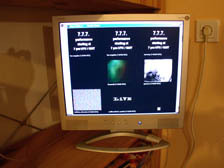 This is a photo of the Aether 9 performance displayed on the Wd8 kitchen monitor. More details about the performance will be at the Aether 9 website. 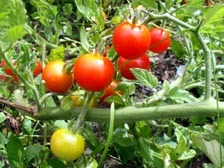 The first tomatoes this year from the Wd8 vegetable garden are almost ripe. Tomorrow the first tomatoes will be prepared live during the Aether 777 performance. The last photo of the finished roof. The Wd8-recycling-terrace will be next. A terrace made completely out of the old parts of glue used for the tiles in the old Wd8 bathroom. Just before the animal disappeared again, it allowed me to take a close-up photo. Here is the portrait photo. This evening i started to remove the growing pile of old grass in front of the Wd8 terrace. 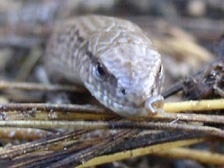 After removing the top layer of grass, plants and earth, i found an unknown Wd8 resident. A little snake was hidden in the pile. 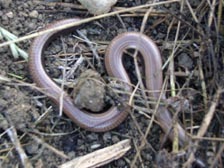 Of course this animal is not a snake, but a so-called 'slow worm'. It was a bit confused and just stayed where it was. Only when i came back with the camera it got a little scared and smoothly disappeared again in the remaining parts of the pile of compost. 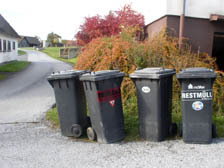 In Walkersdorf the trash is collected only once every six weeks. So only once every six weeks you can see the Wd8 trashcan standing in front of the house. The sticker on the Wd8 trashcan can be ordered at the No Men's Land gift shop. Day by day the work on the roof continues.. and more and more the roof of the Wd8 terrace is looking like a roof. The roof of the Wd8 terrace hasn't been finished before summer as it was planned. 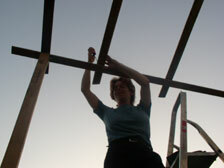 But the construction is continuing weekly and it won't be long anymore until the the roof will be ready. The start of the summer was the right moment to finally cut off the meters high plants in front of the window. 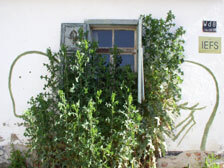 After one month the window and the drawing by Elffriede are now visible again. A photo made on the evening of the longest day of the year. Originally there was a plan to make a midsummer night bonfire this evening, but there was a thunderstorm and heavy wind, so the fire was cancelled. However the sky after the storm with the setting sun was just as beautiful as the fire would have been. Tjaša and Gaja, alias Rot Pulojva, are back in Walkersdorf. 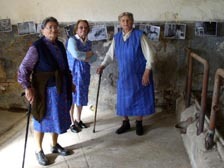 This time they are exploring the village and meeting the local people, closely followed by Eva Ursprung who is documenting their experiences for the film 'Once Upon A Time'. On Tuesday morning they had a coffee at the local cafe, observing daily life in Walkersdorf. 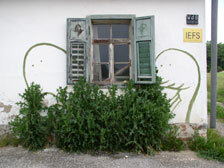 Nature is creating a new composition together with the drawing of Elffriede. Wd8 will take part in the 2nd Aether 9 performance, this time in Brussels, Belgium. This evening the tale 'The Girl Without Hands' will be performed. A performance with 9 webcams all over the world visualizing the story, together, at the same time, live. Japanese-canadian artist Yuki visited Wd8. 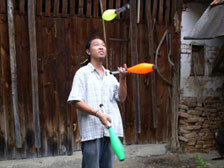 He spent the evening juggling with 5 balls and with other objects found at Wd8, including balancing the more than 30 years old rake on his head. Every year a returning problem: how will the Wd8 grass be cut? This year on June 7th, Sigi came to Wd8 and showed us how to turn the 30 years old scythe into a sharp cutting instrument again, with nothing more than a hammer and a special piece of metal, called a 'dengelstock' and a 'dengelhammer', that one of the 80 years old neighbours borrowed us for the occasion. And eventually in one afternoon almost the whole Wd8 meadow was cut. The IEFS team was on the road with camera and canvas today in Walkersdorf. Together with Christine Winkler and Eva Ursprung they made a round through Walkersdorf, taking the first photos of the inhabitants and their gardens. Slowly the construction of the Wd8 terrace continues. 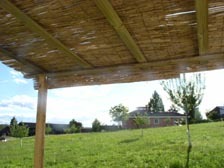 The roof, that will give some shadow to the terrace and the pond, should be finished before summer. The Wd8 website has been redesigned! Hopefully the new website will give a lot more information about all the things going on at Wd8. Enjoy! Wd8 will take part in the Aether 9 performance, tonight in Geneva, Switzerland. 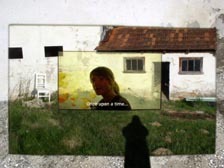 From April 29 till May 1, 2007, Wd8 will be the studio for the recordings of the film 'Once Upon A Time' by Eva Ursprung and the film 'Shadow on the Wall' by Tjasa and Gaja, alias Red Pullover. 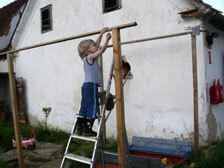 Friday, March 23, 2007 has marked the start of the research project by IEFS at Wd8. The project was started taking a 'Spatenstich' photo at Wd8. During the coming months the IEFS team will be going around Walkersdorf frequently, interviewing the local residents about their gardens and their views about contemporary art. A presentation of the project will be held later this year on a location somewhere in Walkersdorf. Regular updates about the project will be presented on the Wd8 website.